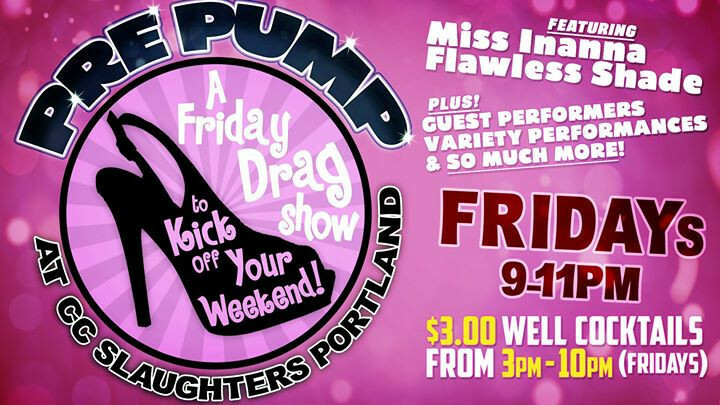 Introducing "PRE PUMP" a Friday night DRAG SHOW to kick off your weekend! FEAT. Tajh Jordan "Flawless Shade" & Cody Wojahn "Miss Inanna" >> PLUS amazing drag/variety talent performing for you live on the the CC Slaughters Portland dance-floor EVERY FRIDAY! >>> & when the party is warmed up and it's time to dance (11pm) the CC's dance-floor opens up and our LIVE DJ bumps the hottest top remixes until 2AM! >>> DRINK SPECIALS? >>> $3 well cocktails from 3pm-midnight!